The first reference to Kiriath-jearim is in Joshua 9:17 where it is listed as one of the cities of the Hivites along with Gibeon, Chephirah, and Beeroth. These cities were located on the western side of the Judean hill country. The name, Kiriath-jearim, means “city of forests” or wood, and is identified with Deir el-Azar. The Arab village at the site today is called Abu Ghosh and can be seen about nine miles west of Jerusalem to the right of the main highway to Tel Aviv. Several other names are given for the place. It is called Kiriath-baal (Joshua 15:60; 18:14), Baalah (Joshua 15:9), possibly Baalath (1 Kings 9:18), and Baale-judah (2 Samuel 6:2). Perhaps the simplest and correct explanation is that the Israelites changed the name from a place that honored Baal to a geographical one, the city of forests. 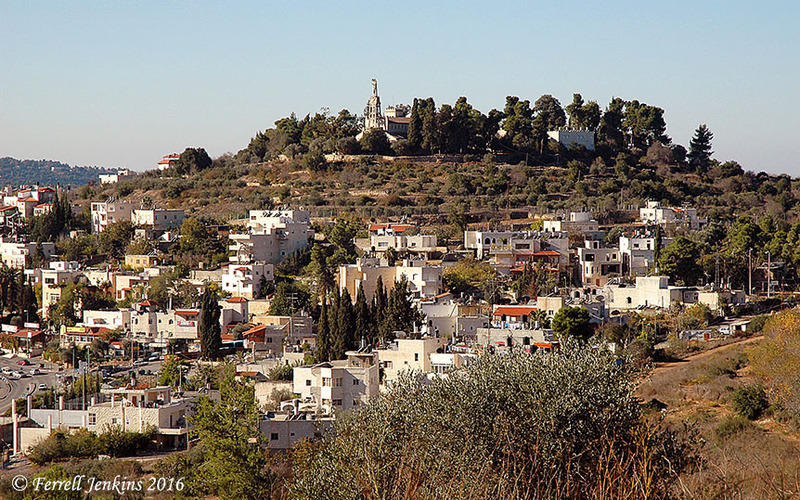 The hill towering above Abu Ghosh is the site of Kiriath-jearim. View west. Photo by Ferrell Jenkins. When the Danites moved from their allotted territory to the north they camped a little to the west of Kiriath-jearim at a place they called Mahaneh-dan (Camp of Dan; Judges 18:11-12). Kiriath-jearim’s highest honor is in the association with the ark of the covenant. The Israelites took the ark from the tabernacle at Shiloh to the battle field at Ebenezer when they were fighting with the Philistines (1 Samuel 4). The ark was captured by the Philistines and taken to Ashdod, then to Gath, and finally to Ekron before they decided to get rid of it. The ark was returned to Beth-shemesh (1 Samuel 4-6). The men of Beth-shemesh sent messengers to the residents of Kiriath-jearim asking them to come and take the ark to their town. The ark was brought into the house of Abinadad on the hill. His son, Eleazar, was consecrated by the men of the city to keep the ark of the LORD. The ark remained there for many years until David had it brought to Jerusalem (1 Samuel 6:21-7:2; 2 Samuel 6). Our Lady of the Ark of the Covenant Church was built in 1911 on the ruins of a fifth century Byzantine church. Photo by Ferrell Jenkins. A prophet named Uriah, a contemporary of Jeremiah, lived at Kiriath-jearim. He preached a message similar to that of Jeremiah regarding Jerusalem in the days of the Babylonian threat. When he was threatened by King Jehoiakim he fled to Egypt, but was captured and brought back to Jerusalem and put to death (Jeremiah 26:20-24). 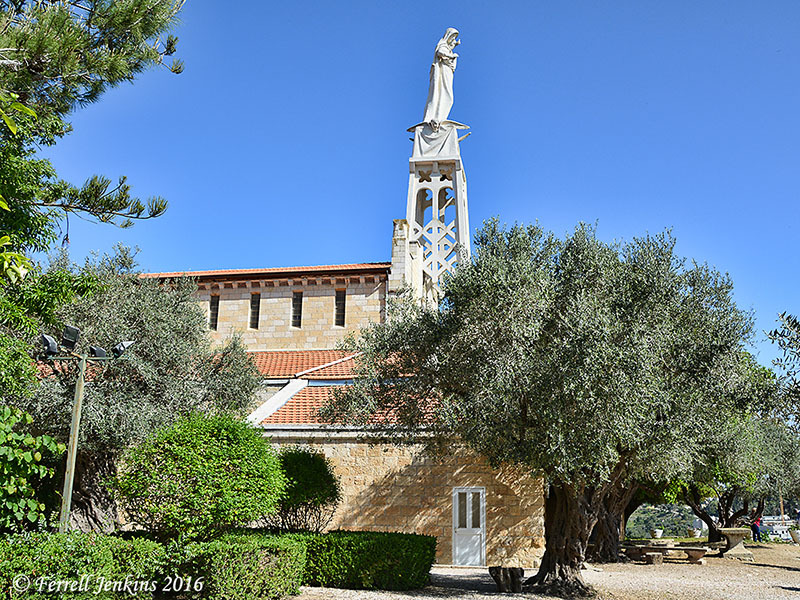 This entry was posted in Bible Places, Bible Study, Israel, Old Testament, Photography, Travel. Bookmark the permalink.